Aww Sukhia Sukhia Now! - Mark Miewurd's HelloFLA! Tsk tsk, Mr. Sukhia. Did you think voters were stupid? You can crop your pictures on your website, but you can’t hide from your record. 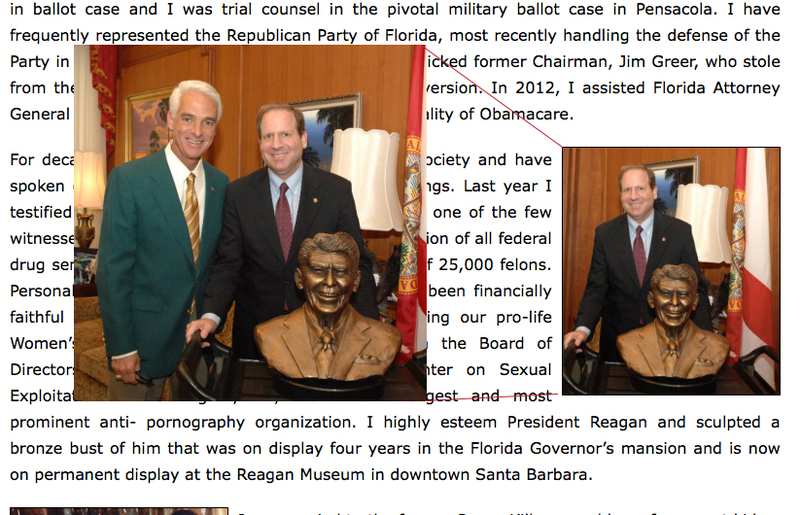 You’re obviously embarrassed by your connection to Charlie Crist. So much so that you chopped Charlie out of the photo you put on your website. Look on the bright side, Charlie was just one of the worst governors we’ve had since Governor Sidney Johnson Catts, but at least he isn’t a ruthless dictator (like Jeff Moran’s boss)! Still, you can’t enter the most colorful race in Florida without getting exposure. What’s else are you hiding? I’m sure you won’t tell voters about the time you represented the Ultra-Liberal Ralph Nader to help him get a spot on the ballot. I’m guessing you’ll make up some story about how it was the “conservative” position to help ultra-liberals get ballot access. That argument may fly in your country club set, but this district is deep in panhandle of Florida. That kind of backwards thinking is just not going to fly among the folks who keep their money under their mattress because they don’t trust banks. But Sukhia thinks anybody who pays cash for things is shady.